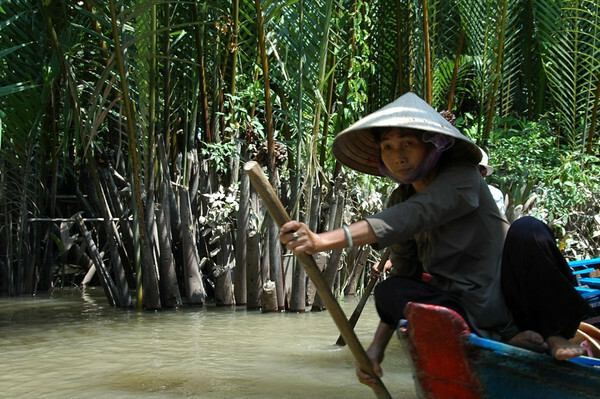 Mekong Delta travel highlights. Includes Saigon to My Tho by boat, Ben Tre, Can Tho, Cai Rang floating market, Chau Doc, floating fishing villages, a Cham community, and a ride through the Cambodian border. 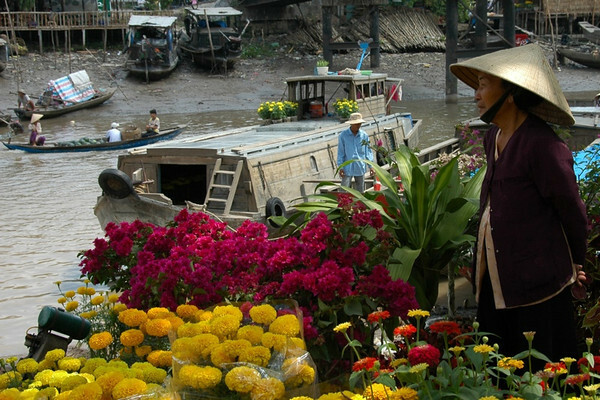 Read about our journey from Saigon to Phnom Penh on the Mekong. 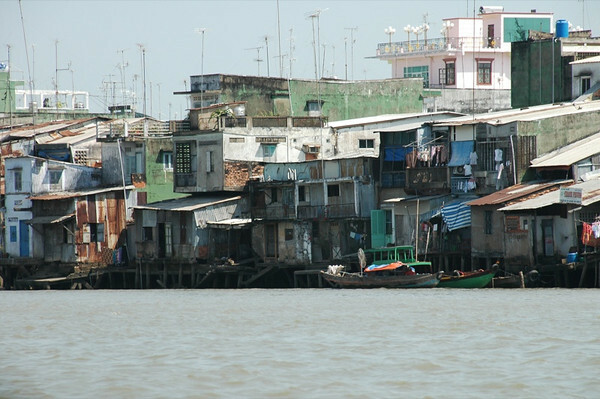 The area around HCMC along the Mekong River is tightly packed with all manner of buildings and houses on stilts. 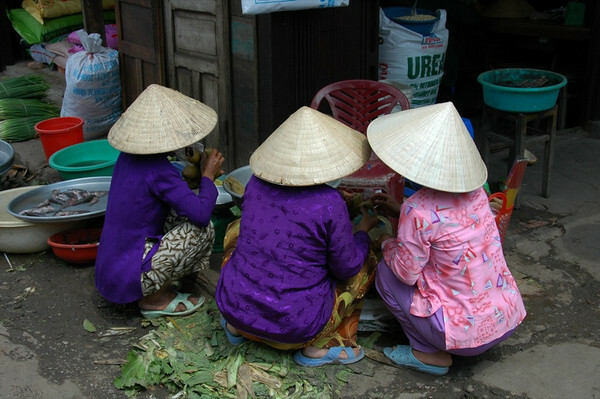 Read about our journey from Saigon to Phnom Penh on the Mekong. We took a boat from Saigon to My Tho. 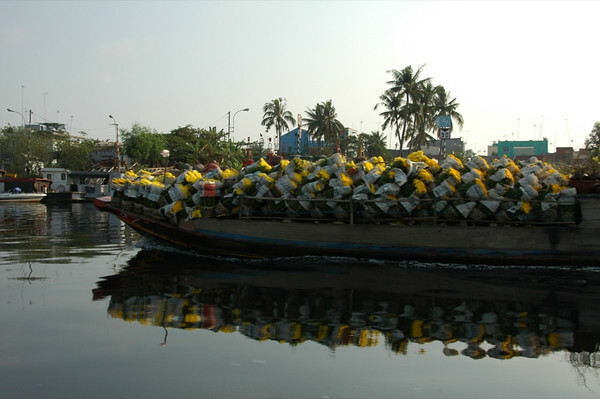 While we were going south, many boats were headed north, loaded with flowers for the city's Tet celebrations. 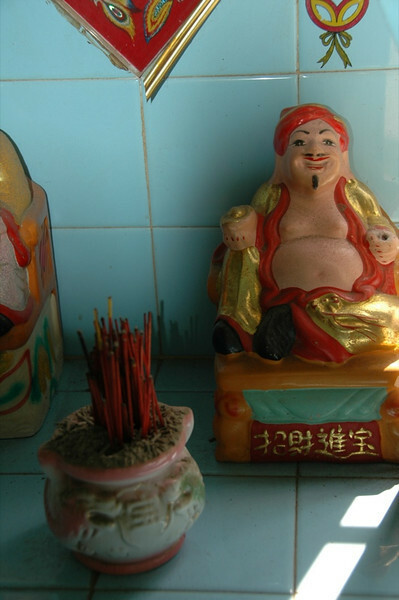 Read about our journey from Saigon to Phnom Penh on the Mekong. A small boat took us through narrow canals to a dock where we boarded a larger boat to return to My Tho. Unfortunately, these boats aren't made for long legs like Dan's. 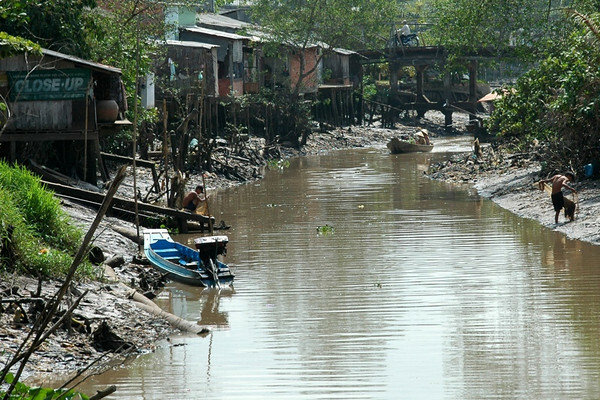 Read about our journey from Saigon to Phnom Penh on the Mekong. 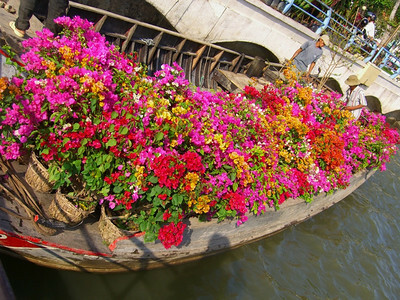 Docked at My Tho, this boat unloads pots of bougainvillea for the Tet flower market. Read about our journey from Saigon to Phnom Penh on the Mekong. 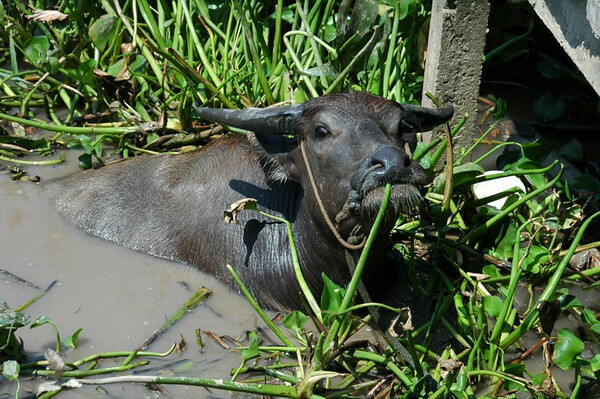 A water buffalo takes a snack under a footbridge at Ban Tre. Read about our journey from Saigon to Phnom Penh on the Mekong. A boat ride in small canals lined with palm trees near Ben Tre island. These rowers work hard, endlessly paddling tourists back and forth to the dock to get on a bigger boat. 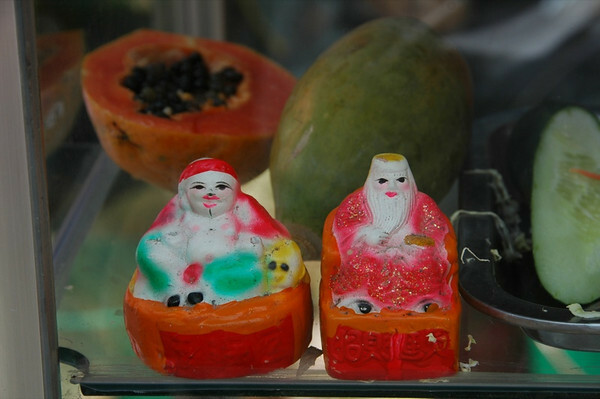 Read about our journey from Saigon to Phnom Penh on the Mekong. 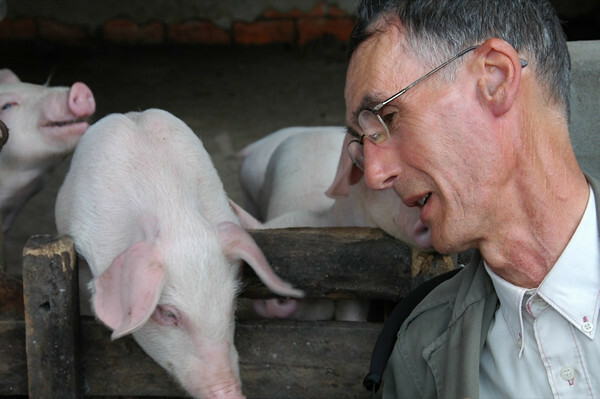 Pigs are everywhere in Southeast Asia. They blend in and almost become part of the human landscape, so much so that you might accidentally start a conversation with one. Read about our journey from Saigon to Phnom Penh on the Mekong. 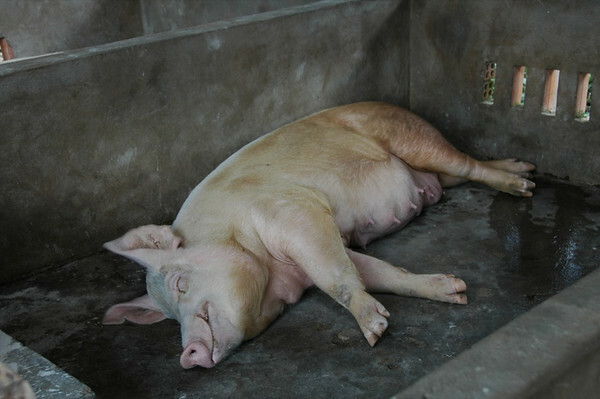 After a long, hard morning's nosh, this one goes down for a rest. Read about our journey from Saigon to Phnom Penh on the Mekong. Simple houses along the river near the town of Can Tho. Read about our journey from Saigon to Phnom Penh on the Mekong. Flowers of all colors and sizes on sale at My Tho's Tet flower market. Read about our journey from Saigon to Phnom Penh on the Mekong. 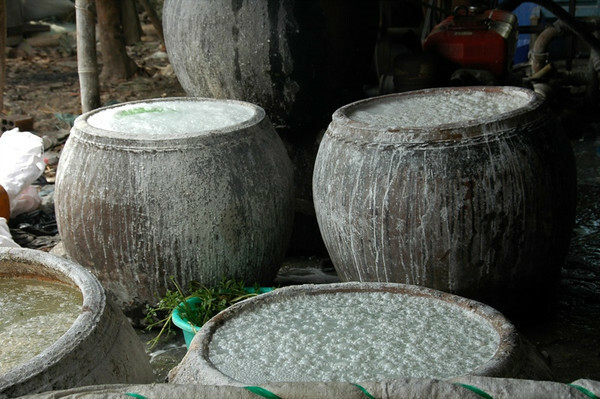 After the floating market, we stopped by a rice noodle making factory near Cai Rang. 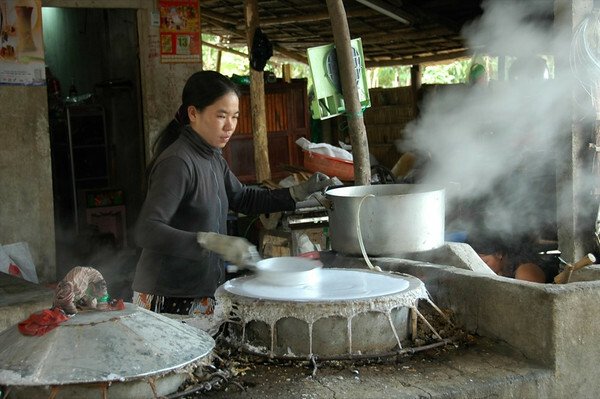 This woman made perfect round rice paper rounds over and over again - it was hard to believe they were hand made. The rounds were then dried outside and later cut for noodles. Read about our journey from Saigon to Phnom Penh on the Mekong. After floating around the floating market, we docked and walked around Cai Rang's market on land. 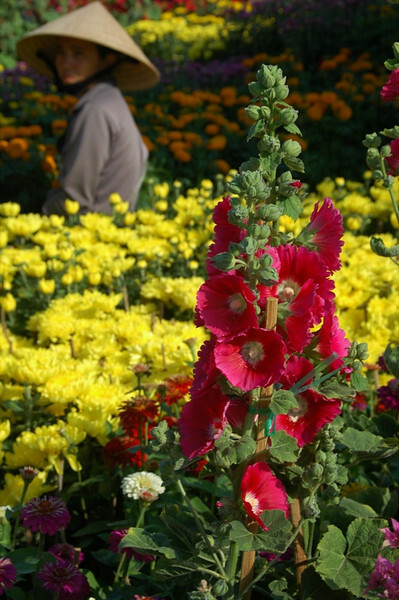 This flower vendor looks out over her Tet flower offering. Read about our journey from Saigon to Phnom Penh on the Mekong. Rice Paper Making - Mekong Delta Read about our journey from Saigon to Phnom Penh on the Mekong. 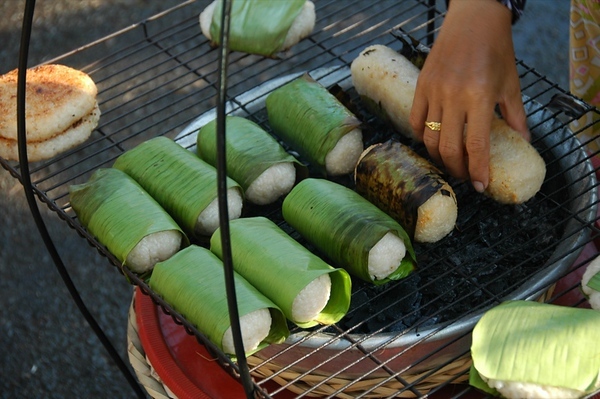 We headed inland from the Mekong River to a rice paper manufacturer and found a slice of life along the canal. 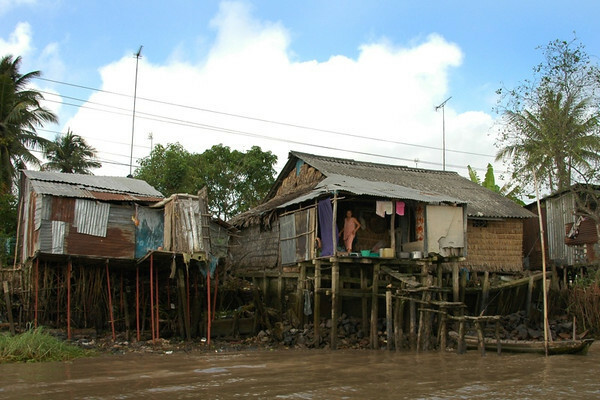 Houses on stilts, fishing and boats define life on these waters. Read about our journey from Saigon to Phnom Penh on the Mekong. 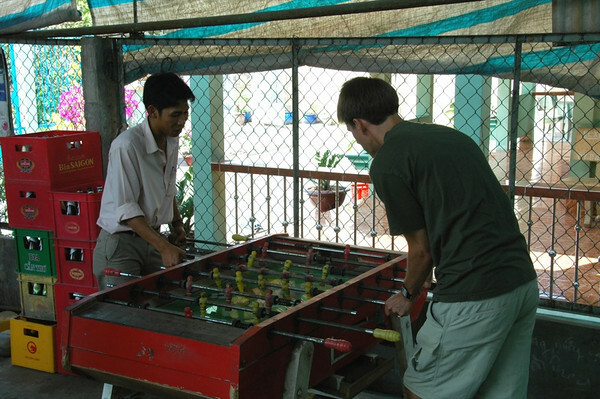 Dan and our guide share a game of foosball outside of Cai Rang. The love of foosball is universal... Read about our journey from Saigon to Phnom Penh on the Mekong. 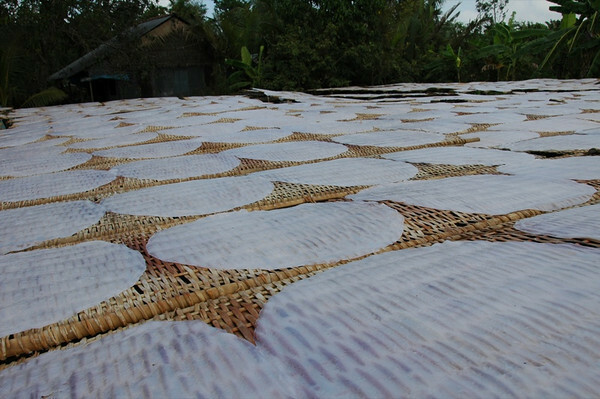 Fresh rice rounds drying before they become noodles. Read about our journey from Saigon to Phnom Penh on the Mekong. Women take a break from their selling to share some food and conversation. How can they balance so well, just a few inches off the ground? Read about our journey from Saigon to Phnom Penh on the Mekong.